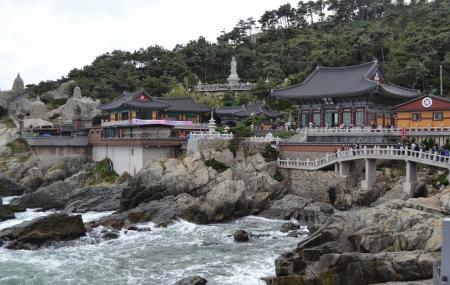 Located on the northeast coast of Busan, this temple is the southernmost temple of South Korea. It is also considered as one of the three sacred places of Goddess Buddha. Its uniqueness is its location as most of the temples of Busan are located on the top of mountain, whereas Haedong Yonggungsa temple is right in front of the sea. This temple was built by the great Buddhist teacher, Naong in 1376, during Goryeo dynasty. Haesu Gwaneum Daebul (Seawater Great Goddess Buddha), Daeungjeon Main Sanctuary, Yongwangdang Shrine, Gulbeop Buddhist Sanctum (enclosed in a cave) and a three-story pagoda with four lions is the overall structure of the temple. Other feature of the temple to watch out is 108 steps. These steps add up the beauty of the temple. While moving down the steps, you can stop mid way and watch the beautiful sunrise (if you are going early morning). It is best to come in the month of April, when the birth of Buddha is celebrated. The entire temple is lit up with electrically lit lanterns. Also, visit the popular attractions in the city by following Busan itinerary 1 day. Early morning is the best time to avoid crowds. Bring water and good walking shoes. Interpretation service is not offered. Best time to visit the temple is in April when Buddha’s birthday is being celebrated. For car parking – 2,000 won and For buses – 5,000 won. How popular is Haedong Yonggungsa Temple? People normally club together Yongdusan Park and Haeundae Beach while planning their visit to Haedong Yonggungsa Temple. People also prefer to start their day with Haedong Yonggungsa Temple.